Brett & and stellar guitar student. Each new student receives on free trial lesson. This gives us as teachers a chance to assess where they are at, whether they are a brand new beginner or they have been studying for years. This also gives the student a chance to see if we are a good fit for them and their learning style. Pianist Kristen Landrum is Nationally Certified Teacher of Music with a Masters in Piano Performance and Pedagogy from SMU. She has been teaching for 9 years and playing for 16. Guitarist Brett Landrum is sought after for worship services and festivals. He has been teaching for 3 years and playing and performing for 14. Studio lessons begin at $116/mo for 30 min lessons. In-home lessons begin at $210 for 4 30 min lessons. Kristen began teaching as a part of her babysitting service in high school. Her first real teaching experience was while an undergraduate piano student. It didn't take much for her to catch the bug and pursue an advanced degree in piano teaching. 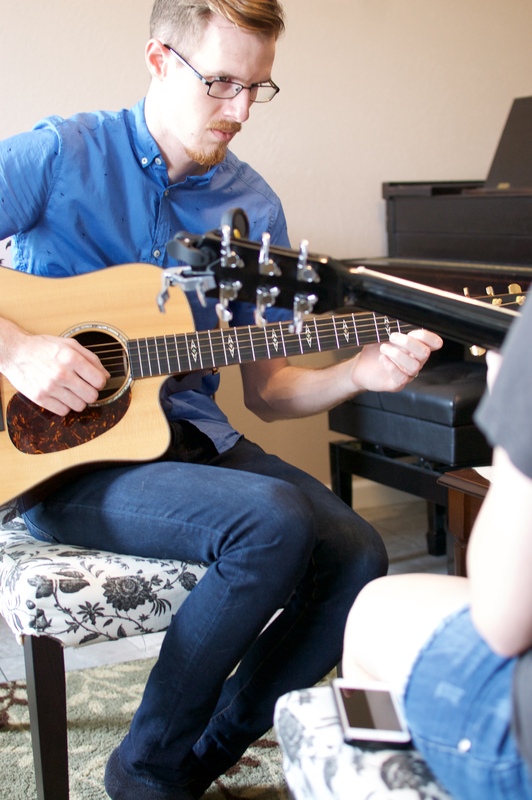 Brett began teaching while trying to unite his passions of youth education and guitar performance. With a degree in youth ministries, he has a background in youth psychology and learning styles. He combined this knoweledge with his long history of guitar performance and has fallen in love with this profession. From ages 4-104 all ages and abilities are welcome. Students who are curious and willing to try new things are some of our favorites to work with -- we are always trying new activities or ways of approaching music in our pursuit of teaching excellence. In the past we have hosted "student-only" Christmas parties where students are able to perform in a low-stress environment and celebrate music together. This year we look forward to monthly student classes that will provide this same environment and four recital/concert opportunities where students can gain valuable performance experience. Always take a trial lesson! Even if the teacher charges for the lesson it is important to have a chance to experience an actual music lesson with them. Personality is a huge part of what will make lessons work -- or not work. You want to make sure that you and your teacher will get a long. Music lessons are a lot of work -- and some teachers have higher expectations than others. If a student comes to us and says they want to pursue a college audition in music we are going to push them and expect more practice from them than a student who comes and says they just want to play for fun. Even a student who just wants to play for fun will need to practice some, it is mastery that really makes it enjoyable. Find out about your teacher's practice requirements, make-up policies, and any other studio policies they may have.